Rhyme Series. A choice that will stand the test of time. Well-made, efficient products designed to simplify the lives of today's families on the go. NuTone range hoods set the standard for user-friendliness without compromising on performance. This model's features make it a sound invesent that will last for years. Let Ancona Chef Series bring the high standards of professional range hoods to your home. Made with commercial grade stainless steel, the chef under cabinet with LED lights model combines power and elegance featuring stainless steel baffle filters, 4 speed electronic controls and LED lights. Ancona's professional design delivers quiet yet powerful ventilation and easy-clean convenience. This sturdy 30" stainless steel wall-mount chimney range hood provides high performance professional grade ventilation with its powerful 860 CFM internal blower motor. The electronic touch-button controls with LED digital display activate the 6-speed blower and the two 2 W LED lights. Two sturdy stainless steel baffle filters, with handles, efficiently removes grease and heated vapours from the air. Designed for 9' maximum ceiling height and standard ducted vertical exterior installation, the hood integrates a 6" circular exhaust duct connection.. This beautiful 30" stainless steel wall-mount chimney range hood provides high performance professional grade ventilation with its powerful 860 CFM internal blower motor. The electronic touch-button controls, with LED digital display, activate the 6-speed blower and the two 2 W LED lights. Two sturdy stainless steel baffle filters, with handles, efficiently remove grease and heated vapours from the air. 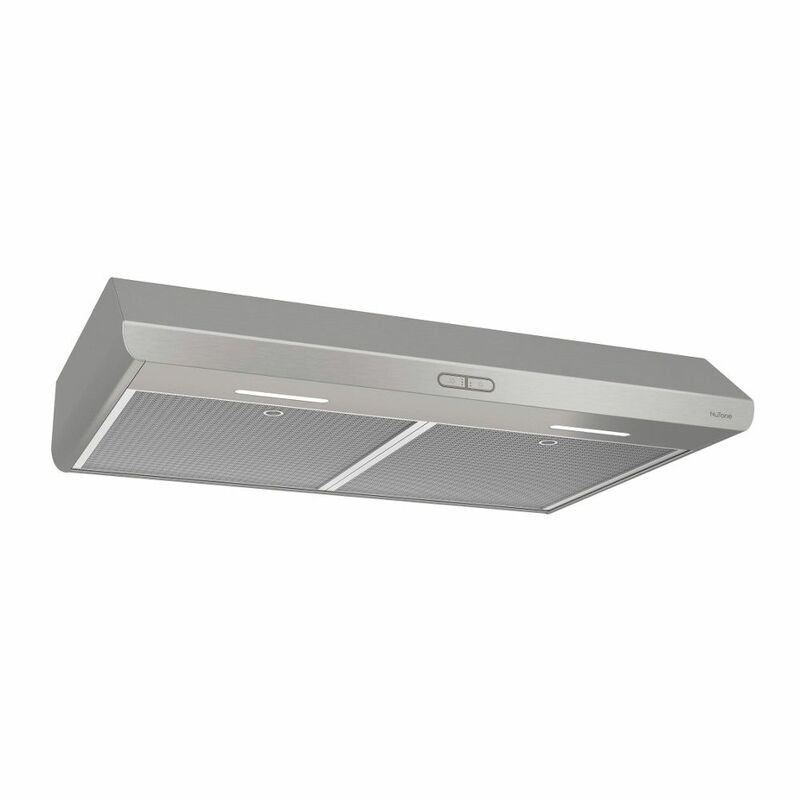 Designed for 9' maximum ceiling height and standard ducted vertical exterior installation, the hood integrates a 6" circular exhaust duct connection. Broan Elite RM50000 wall mounted chimney hood combines graceful curves with traditional European styling to meet today's conventional appliance and kitchen styles. A highly affordable chimney hood, available in white, black or stainless steel to complement your dicor. 30 inch 300 CFM Under cabinet range hood in stainless steel Rhyme Series. A choice that will stand the test of time. Well-made, efficient products designed to simplify the lives of today's families on the go. NuTone range hoods set the standard for user-friendliness without compromising on performance. This model's features make it a sound invesent that will last for years.